Rev. Rufus Anderson, D. D.—Rev. 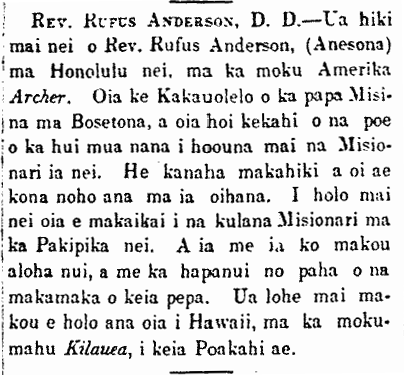 Rufus Anderson (Anesona) has arrived in Honolulu nei, aboard the American ship, Archer. He is the secretary of the Mission Board in Boston, and he is one of the original members of the board that sent Missionaries here. He served in that occupation for forty years or more. He came to check on the condition of the Missionaries here in the Pacific. With him is our great aloha, along with perhaps the majority of the friends of this paper. We heard that he will be going to Hawaii aboard the steamship Kilauea this coming Monday. Ka Nupepa Kuokoa, Buke II, Helu 10, Aoao 2. Maraki 7, 1863. Here is another reference available online. This publication was put out by the American Board of Commissioners for Foreign Missions (ABCFM), reporting home to America on their work throughout the world. Of particular interest to us is what they say about Hawaii. Here for instance is an article appearing in the year of the overthrow, 1893. The Missionary Herald, Volume LXXXIX, Number XII, Page 510. December 1893. …suicide of the monarchy, was the attempt on her part to abrogate the Constitution and by sheer force establish a new one of her own making. Even her subservient ministers refused to endorse the scheme, yet she insisted upon it and sought to incite the populace to stand by her in her autocratic plans. It was then that all the better classes united as one man and deposed her. Never was there a revolution more warranted by facts, never was one more peacefully accomplished, and a queen of worthless character was set aside and the monarchy by its own act came to an end. If Minister Stevens or the commander of the Boston erred in judgment in any transaction, which we are not prepared to admit, yet there is no valid ground for the interference of our government to reverse the revolution months after it was consummated. We do not speak here of the political question as to what it is expedient for the United States to do in reference to a protectorate or to annexation. 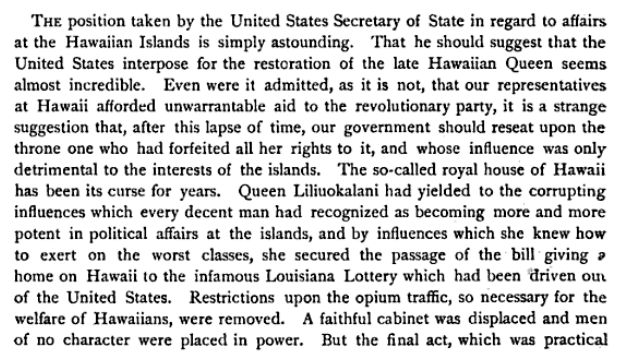 Opinions of these points may differ, but it would seem as if there were no room for difference of opinion in regard to this question of reestablishing the old monarchy on Hawaii. The best portion of her citizens have asked for some form of connection with the United States. Our government has a perfect right to say yes or no to all these proposals. And the Provisional Government at Honolulu has a right to say to us, “Either accept our proposal or hands off.” We regret to be obliged to speak in such terms of propositions that come from our national administration. We certainly should not do so did we not believe that any attempt to restore the Hawaiian Queen to her throne would be a gross outrage, and would be followed by the most serious consequences to the moral and religious interests of the islands, as well as to their material prosperity. We cannot think that our people will tolerate any intervention which has for its object the replacing upon the throne of a sovereign whose influence will be only for evil. A Kanikau for Mrs. Fidelia Church Coan, done in Hawaiian and English! 1872. Composed by request for the Church and friends at Hilo. Tune, A Mother’s Kiss,—Golden Robin. From where kind Spirits blend? To bear away a friend. To teach us words of peace. By waters still and pure. Look upward, lo! what sight is this? To the world though long’st to see. Hark! hark! what notes are these we hear? Our leader kind and dear. Hark! hark! what bell is tolling thus? It is the funeral knell. We march with sorrow’s tread. Mournful we move, and all are hush! The loved one’s form is lower’d, and lo! The clouds are dak’ning round! O cease, ye friends, to mourn. With Jesus she’s at home. I hakuia ma ke noiia mai no ka ekalesia a me na makamaka o Hilo. Leo, A Mother’s Kiss,—Golden Robin. Mai luna mai ke ao? A ma na wai maemae. E nana, e, heaha nei? Pii i ke ao ma o.
Hamau! he lohe aha nei? Hamau! he bele aha nei? [I thought to post this piece because it is one of the few examples where the author/composer did both the Hawaiian and English version. It is interesting to look at the two compositions side by side. This is a kanikau written for Fidelia Church Coan who arrived in Hawaii along with her husband, Titus Coan, on June 6, 1835. They were stationed in Hilo, and she ran a boarding school there for girls. Ka Nupepa Kuokoa, Buke XI, Helu 44, Aoao 7. Novemaba 2, 1872.